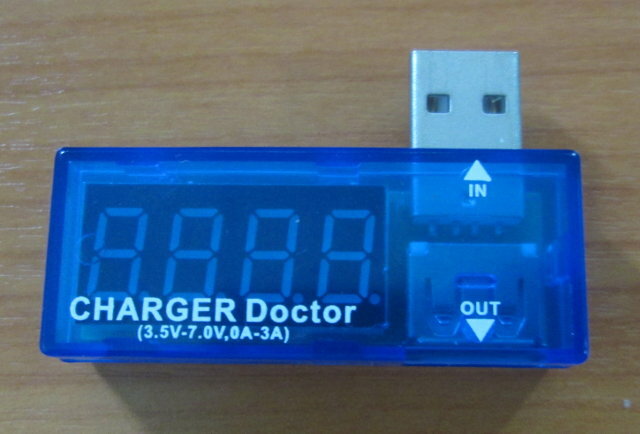 One way to make power measurement for USB powered devices is to make your own USB cable to allow for current measurement via a multimeter, but if you think it’s just too much hassle, I’ve found and purchased a small test device called CHARGER Doctor that shows voltage and current on a 4 digit display, and sells for $5.40 on DealExtreme. The device features a USB female out port, and a USB male input port, that you can place between your USB power adapter, and the cable to your device to alternatively display voltage (4 seconds) and current (9 seconds). It can be used for power consumption measurements, to test if your charger is working normally, or finding out the power adapter that will charge your phone the fastest. It’s said to support measurement between 3.5 to 7V and 0 to 3 A, with an accuracy of +/- 1%. I’ve shot a very short video showing the CHARGER Doctor attached to my phone charger. Reviews on DealExtreme are mostly positive saying the device is accurate, however some people said it does not support data, whereas others don’t experience this issue. I’ve connected it between my hub and my camera, and I had no problem browsing the files. However, I would only get proper voltage readings, with current always showing as 0.00A, even when importing videos to my computer. Doing the same test with a USB thumbdrive worked apparently fine showing 5.15V and 0.08 A. So no way to work out power consumption in this case? Power (P) = Voltage (U) x Current (I). If the current is zero, then power is zero. One reason could be that my camera current was less than 0.01 during the test (So less than 50 mW), or at least less than could be measured accurately with the device. For low power consumption and/or better accuracy, using a multimeter is preferable, but I still think in many cases, this cheap and small meter can be useful. I have this one. Bought it from ebay for $3 including shipping. I must say though that build quality seems really bad, the soldering is bad that is. Also I’m having strange problems with some devices not charging properly when connected through. When it works though it is kinda cool and it seem pretty accurate. Any way to hook some arduino to sniff the values of the screen in order to do some real data logging? Most of the soldering pads on it are quite large so it shouldn’t be much of a problem to hook something up. The real problem is just where I think. @onebir No current displayed? Simple: the camera is propably powered by it’s own battery so no power is taken from the USB-port, it is only used for data-transmission. And when no power is used no current can be measured. I should have thought about it, as the camera battery will just discharge if I leave it connected to my PC. Data transmission should also consume some power, but I guess the device only measures current from the VCC pin, and not the D+/D- pins of the USB connector… I think I got it!